Recommend clients try these tasty, high-fiber salads that will help them lose weight more effectively—and keep it off. 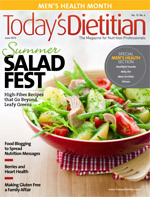 Now that summer’s here, many clients will choose to eat more salads to either lose or maintain their weight. They’ll fill their plates with iceberg, romaine, spinach, or other leafy greens topped with high-fiber ingredients such as beans, vegetables, and fruit to get off to a good start. But there will be some clients who may become bored with eating the same type of salad each day and perhaps go back to eating more calorie-dense fare. The good news is there are many different types of salads clients can eat—salads that aren’t necessarily lettuce based but are even higher in fiber, which can increase satiety and help clients lose or maintain weight more effectively. Most people associate fiber with digestive health—and perhaps even with heart health—but they’re less likely to link fiber with weight management benefits. Research in the Journal of Nutrition suggests that eating more fiber can prevent weight gain and may encourage weight loss. Brigham Young University researchers followed the eating habits of 252 middle-aged women for nearly two years and found that those who increased their fiber intake typically lost weight while those who decreased fiber intake gained weight. In light of these findings, nutrition professionals are in a better position to broach the subject of fiber from the standpoint of weight loss and weight control with clients who want to incorporate more salads into their diet. Tanya Zuckerbrot, MS, RD, creator of the F-Factor Diet and author of The Miracle Carb Diet: Make Calories & Fat Disappear — With Fiber!, calls fiber a “miracle carb” for several reasons: It has zero calories, so high-fiber foods naturally are low in calories; fiber soaks up excess fat and calories in the stomach after a meal and ushers them out of the body before they convert to fat; the body’s effort to digest fiber (which it can’t) boosts metabolism; and fiber adds volume to food and slows digestion, so fiber-rich foods fill you up and keep you satisfied longer. “This is great for dieters because it helps them lose weight without hunger,” Zuckerbrot says. While there’s been plenty of research on satiety and what exactly influences it, there’s still much to comprehend. But research indicates that fiber affects the feeling of being full, even if the reason isn’t completely understood. Barbara J. Rolls, PhD, director of The Laboratory for Study of Human Ingestive Behavior at Penn State University and author of more than 250 scientific articles and six books, including The Ultimate Volumetrics Diet, has developed a volumetrics theory linking volume to satiety with the idea that foods with a higher volume will suppress the desire to eat again for longer periods of time. Moreover, in research published in Appetite, Rolls and her colleague determined that consuming whole fruit boosts satiety more than fruit juice. Researchers measured satiety levels in subjects who consumed apples, applesauce, and apple juice. Overall, the whole apple increased satiety the most even when adding naturally occurring fiber to the apple juice. The results suggest that eating fruit at the start of a meal can reduce energy intake. But the question remains: Does the satiety come from the fiber itself or from a mechanism like the increased chewing involved? The fact that most high-fiber foods require extra chewing seems to be a benefit in feeling full, but it’s the calorie density that’s really key, Rolls says. “Choosing foods that are lower in calorie density, such as fruits and vegetables, is going to give you more satisfying portions,” she notes. Even clients who don’t like beans may find them more palatable when tossed in a salad with a tasty dressing, says Julie Jones, PhD, CNS, LN, distinguished scholar and professor emerita in the foods and nutrition department at St Catherine University in St Paul, Minnesota. “Your client may not be willing to sit down and eat a bowl of beans, but if they mix some toasted soybeans or some garbanzo beans into a salad, suddenly it sounds a lot more appealing,” she explains. Below are some delicious salad recipes to share with clients to help them boost their fiber intake and lose or maintain their weight in the process. Since many of them already are making green salads with a lettuce base, Today’s Dietitian asked RDs and cookbook authors to provide their favorite non–lettuce-based recipes to spice things up and keep meals interesting. 1. Place the lentils and 1 1/2 cups of water in a medium saucepan. Bring to a boil, then reduce the heat, cover, and simmer until just tender, about 30 minutes. Drain. 2. Meanwhile, heat 2 tsp of the oil in a large nonstick skillet over medium-low heat. Add the garlic, ginger, and cumin and cook for 2 minutes. Add the leek, carrot, and 2 T water and cook until the vegetables are soft and lightly browned, about 8 minutes; drizzle with a couple of tablespoons of water if they get too dry and start to stick. Transfer from the skillet to a medium bowl and add the cooked lentils. 3. Whisk together the vinegar, the remaining oil, and the mustard in a small bowl. Drizzle over the lentil mixture and season with salt and pepper if desired. Stir gently to mix well. 4. Heat the skillet over medium heat and add the spinach. Cook until the spinach barely softens, 2 to 4 minutes. Place on a small platter and top with the lentils. 1. Place pasta, salmon, asparagus, and green onions in serving bowl. 2. Blend dressing ingredients until smooth. Add to pasta salad ingredients and stir to mix. 1. Boil and drain orzo. 2. In food processor, purée pesto ingredients. 3. Toss pesto with cooked orzo and remaining ingredients. 2. When corn cools, cut the kernels off into a bowl. 3. Add the onions, beans, jalapeño, red bell pepper, and tomatoes, and set aside. 4. For dressing: Combine ingredients in a small bowl and pour over the corn mixture and toss. Let sit in the refrigerator for an hour, or overnight, before serving.